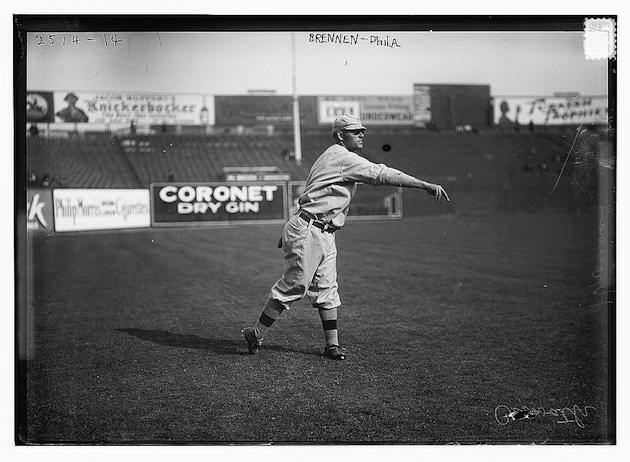 Before Dave Winfield and Randy Johnson killed birds on the field, there was Gavvy Cravath. Before Dave Winfield and Randy Johnson, Gavvy Cravath once accidentally killed a bird on the field. Legend has it, according to Cravath’s SABR biography, that he was playing in semi-pro game in his native Southern California when he knocked a seagull dead with a powerful line drive. Some Spanish-speaking fans started shouting “gaviota,” the Spanish word for seagull. Other fans thought it was a cheer, so Cravath had a new nickname. His real name was Clifford Carlton Cravath. He was also called “Cactus” (for his home state) and “Wooden Shoes” (for his lousy outfield defense). Cravath made up for his wooden shoes with a powerful bat, leading the National League in home runs six times and leading the majors four times. “Cravath was a natural batsman of the swing-from-the-toes school, and like most exponents of this style will probably be able to punish the horsehide as long as he can hobble up to the plate,” a 1921 article in the Sacramento Union read. His 24 homers in 1915 were 11 more than any other NL player, and a major-league record until Babe Ruth hit 29 in 1919. How did he do it? MLB.com’s Glen Sparks writes that Cravath, a righthanded batter, learned to hit to the opposite field while playing in Minneapolis, where the rightfield fence was only 279 feet away. He hit 14 home runs in 1910 and set an organized baseball record in 1911 with 29, to go with a .363 batting average. And, the Cactus didn’t hit a bunch of cheapies, either. He ripped some completely out of the yard. Once, he broke the same window on Nicollet Avenue three times in one week. Cravath ended up in Minneapolis after failed stints with the Red Sox, White Sox and Senators, but the new swing he learned with the Millers earned him a shot with the Phillies. In Philadelphia, Cravath took advantage of bandbox ballpark, the Baker Bowl with its 280-foot rightfield fence. He lasted nine seasons in Philly and was also the team’s manager in 1920, his final major-league season. He played two more seasons in the minors out west, one with the Salt Lake City Bees (also known as the Mormons) and one year back with the Millers, before retiring at age 41. Cravath returned to California after retiring, became a judge and died at age 82.